“Print your image in my heart, as a mark that will never be erased from my soul”. 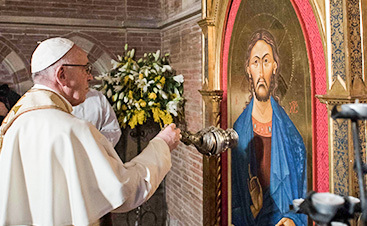 We are an adult art school dedicated to training people in Christian liturgical art. 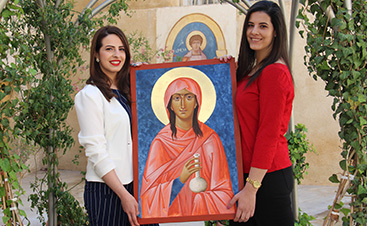 Founded in 2010 to run short courses in iconography at the Emmanuel Monastery in Bethlehem, the Bethlehem Icon School has grown to offer a range of opportunities to study iconography up to a professional level in its own dedicated premises in the heart of Bethlehem’s Old City. The Centre is open for the use of its students Monday – Saturday, 9am – 4.30pm around the year apart from major holidays. The School has dedicated classroom and studio space, fully equipped to enable students to paint icons to the highest professional level. There is a specialist library dedicated to iconography with wifi access. We have our own chapel, which also is open to pilgrims passing along Star Street to the Church of the Nativity which is close by. Priest students are able to arrange to say Mass there with the permission of the Melkite Patriarchate. There is a small art shop which provides all the supplies necessary to participate in the courses, from pigments to gilding tools, from brushes to pencils. There is a cafeteria for students to relax and socialise, as well as the tranquility of our courtyard garden. Students on all our courses have access to all the Icon Centre’s facilities. All areas of our Centre are wheelchair accessible. We attract students of all ages and backgrounds, primarily from the Holy Land but we also welcome students from around the world. Regular students number about 35. We are a diverse community mainly drawn from the Mekite, Orthodox, Latin, Assyrian, Armenian and Maronite communities of the Holy Land, but occasionally augmented by individuals from all faith backgrounds and none. Some are studying full time, some part time, some for an extended period of time others for a short intensive course. A few have no artistic training, others are noted artists in their own right. Instruction at the Icon School is based on the timeless principles of eastern Christian iconography, commonly called ‘Byzantine iconography’. We approach icon painting as an art of the transfiguration of the natural world, as the creation of doorways from heaven to earth and as integral to the Divine Liturgy of the Christian Church. The course material is provided in the form of a high quality printed manual which is available for purchase at the Centre. 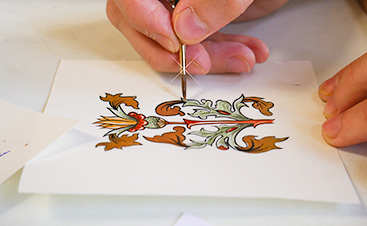 At the heart of our community are those studying for the two year, full time Prince’s School of Traditional Arts (PSTA) Certificate Course and students on the part time Ongoing Training Course. These classes run during our three eight week terms. However, students on these courses have access to all our facilities throughout the year. 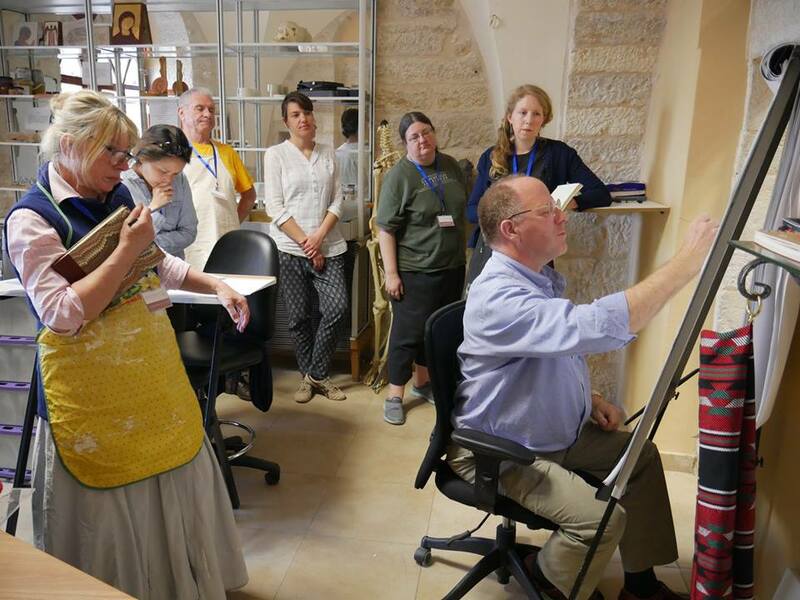 We also continue to run our intensive 7 day icon painting course which takes place regularly throughout the year. These are hugely popular and see participants returning year on year. We also have individuals from around the world who join our classes for a shorter or longer period of time depending on their circumstances. These include priests and religious on sabbatical, art students, and lay people interested in the spirituality of the icon etc. Please contact us directly to discuss possibilities tailored to your situation. Locals: Tuition is free but there is a 1200NIS fee per annum to pay for the Assessor to come from the UK. We also host existing groups of icon painters who either bring their own tutors or wish to have a tailored made course. Please contact us directly to discuss possibilities.